Frank Oppenheimer was right, “The best way to learn is to teach”. In this post I hope to share what three years of teaching master's students has taught me. Are your social media or content marketing efforts under performing? Before you spend any more time tweaking your content strategy and online tactics, ask yourself honestly: How engaging is my brand? Content doesn't engage an audience, brand identity does. And that is the first place you should look if you're not getting traction online. How do you brand a location and what role can digital media play in that endeavor? These are some of the main topics explored by representatives of The Duffy Agency as they hosted a delegation of city officials, academics and marketers from St. Petersburg, Russia. What do you call an online campaign that is centered around a game or contest? You guessed it: “Gampaign”. Today we launched our latest game, “Search Party”, for our fashion client Napapijri. The premise is simple: While shooting their Fall/Winter collection in Iceland, they left 3 bags behind. Create a search party and find the bag using an interactive map and you could win tickets for 4 to Iceland. No doubt you have an opinion on the best and worst Super Bowl commercials from yesterday's game. In my opinion, the best way to judge the effectiveness of an ad is by how well it fulfills the objective of the brief. An ad that doesn't appeal to me, but appeals to my Mom, may be a good ad because that is to whom the ad was supposed to appeal. So, from that perspective, I will give all the ads the benefit of the doubt that they each of them fulfilled their brief. Having said that, here is my critique of the ads that stood out from a brand or messaging point of view. Hey it's that time of year again. In order to keep people from "gaming" the Google algorithm,Google has actually started placing less importance on things like keywords and meta-tags and instead is trying to use how people interact with content as a means of determining relevancy. What this mean for companies is that content and getting people to share and engage with that content is the most significant way to rise in Google rankings. To ensure success, brands need to evaluate and optimize the content on all their online assets. The following is an outline to the 8-step process The Duffy Agency uses to help clients optimize their online assets. OK, all the Americans at The Duffy Agency have now voted. Like many Americans, I'll be watching the results come in for the rest of the day trying to piece together the fragments and get a glimpse into the future of who will be my country's next president. In that spirit, I've turned to online networks and Google to see how the candidates stack up there. This is a bit like peering into tea leaves to forsee the future, but go ahead and see if these rankings tell you who the next US president will be. As we enter the final quarter of 2012, it is time to start thinking and planning for 2013. We’ve put together a quick check list to help make the most of Q4 and get you ready for 2013. The life expectancy of a CMO has reached an all time high of 3.5 years (nearly double what is was five years ago) but it seems the rift between CEOs and their CMOs has never been greater. So what needs to change to move forward? COMING TO TERMS: WHAT IS A BRAND? WHAT IS BRANDING? In today's Brand Rants post, Sean Duffy tries to come to terms with defining a brand and branding. There’s little wonder why people have so much trouble defining a brand or branding. One brand "expert" tells us that branding is all about graphic guidelines while others say it’s a promise, or a covenant, or a look, or a feel, or an attitude, or an emotion, or an association, or a perception, or a bond, or an experience, or even a religion. So what exactly is it? 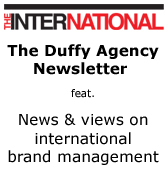 In today's BrandRanter post, The Duffy Agency founder, Sean Duffy, talks about effective product launches. Today, Apple will announce the new iPhone 5, and analysts are expecting it to become the fastest selling smart phone in history. How does Apple seem to do this with every iteration of the iPhone? Because unlike most companies, which simply "release" a new product, Apple understands how to truly "launch" a product. Marketing professional share an extensive vocabulary of marketing terms. Unfortunately they don't share common definitions for many of those terms. In day-to-day office chatter the differences don't reveal themselves. If you're a golfer then you understand the importance of follow through. The same principles can be applied to developing brand equity. Today's Brand Rants post looks at defined steps to build brand equity. The idea for brand managers is to create a brand strategy and tactical communication plans that combine all ten steps of brand equity development into one smooth swing. Does Google really need help with their brand? The Duffy Agency's Sean Duffy just finished publishing a four-part series on the Google brand, which we at The Duffy Agency believe has not been managed as well as it could be. It's a very quick, but very insightful read. But I’m not saying that their business model is sinister or that they don’t deserve every dime they have earned. For the most part, I’m OK with that arrangement so long as Google can keep me convinced that it will stay true to it’s founders unofficial yet well-hyped corporate motto “Don’t be evil.” That's brand management. To date, they're not doing such a great job. In fact, they're doing a lousy job. Unchecked, I believe this will be the company’s undoing. In Sean Duffy's latest Marketing Moxie column on Talent Zoo, he looks beyond advertising to explore the real value Facebook for brands.